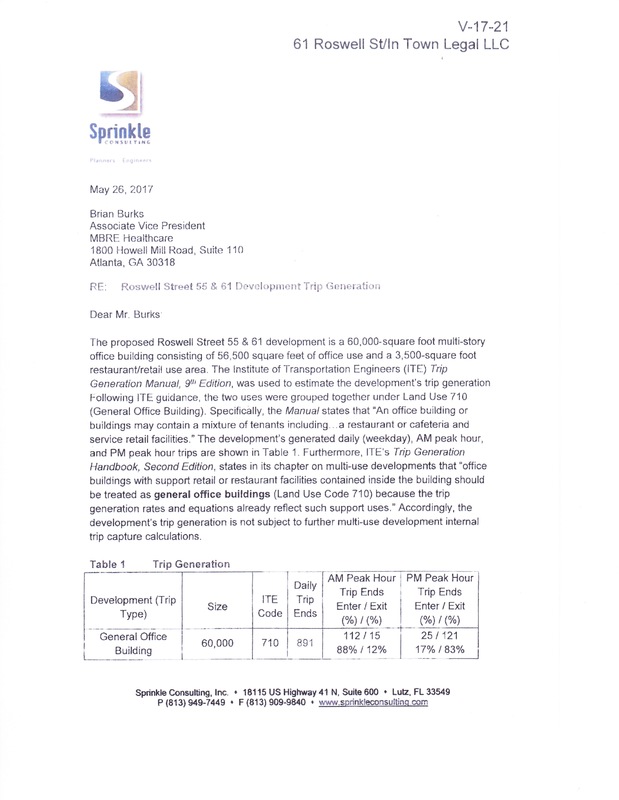 That day in 2016 when Mark Toro, the developer who has built more apartments in Alpharetta than anyone else over the last ten years, begged Georgia State Senators to raise MARTA sales taxes on the people of Alpharetta by 50% because it would be good for his business. I testified that the MARTA sales tax increase would be horrible for the people of Alpharetta. Fortunately for the people of Alpharetta I prevailed. Jim Gilvin is the only candidate for Mayor of Alpharetta who does not rely on developers to fund his political campaigns and keep a roof over his head. Why is that important? Click on the video below to see. 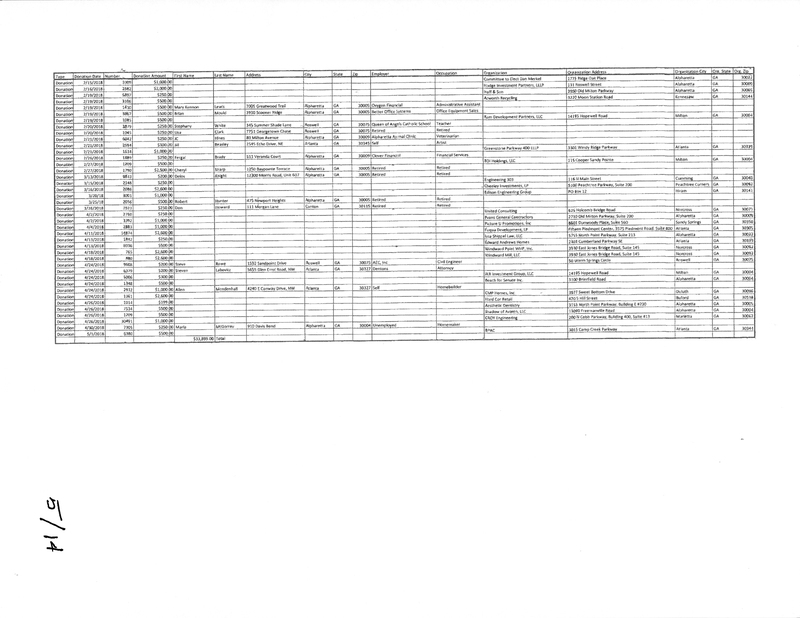 Unfortunately my opponent filed spreadsheets using such a tiny font that it will be difficult for most people to see how many high density mixed use developers and commercial property owners have funded his campaign. 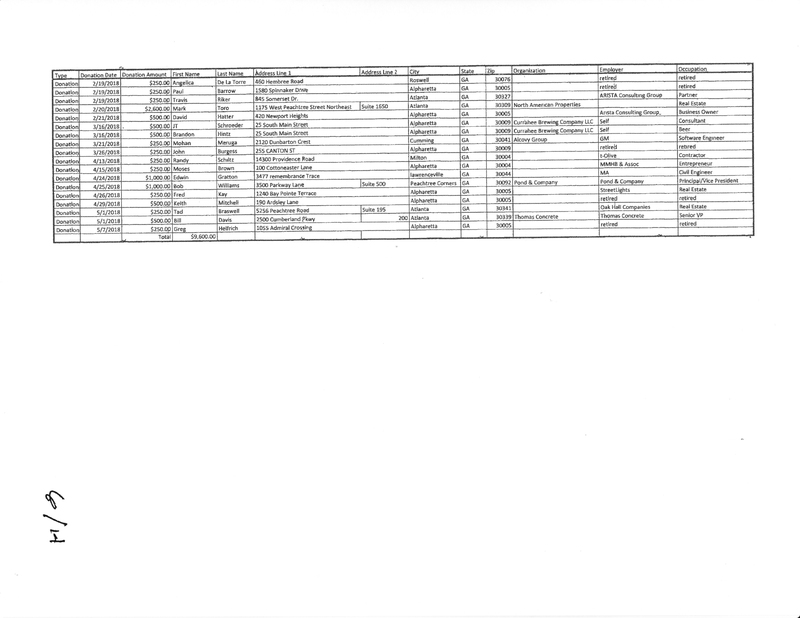 As a public service I have posted them below so you can enlarge them for easier inspection. Alpharetta has had a written goal limiting apartments for as long as I can remember. Unfortunately that goal has been repeatedly ignored by my opponent despite his campaign promises. Here is the truth. Alpharetta voters deserve to know the truth. The truth is that my opponent Chris Owens is the Vice President of Development for a consulting firm that does traffic impact studies for many of the developers building projects in Alpharetta. Strangely that relationship does not show up on his campaign disclosure. The Alpharetta City Council meeting this week included two zoning cases where developers hired Chris Owens’ firm to perform their traffic analyses. According to the analysis provided by Chris Owens’ firm those two projects will add more than 5,000 car trips to Alpharetta traffic every day. Last year Councilman also voted to spend 6.9 million dollars of taxpayer money on a parking deck needed for one of his client’s buildings downtown. Alpharetta residents deserve a mayor who is working for us not developers. This week’s Alpharetta Herald has a great article explaining the differences between my record and the record of my opponent as we served together on city council. You can read the whole article about the candidate forum graciously hosted by Bike Alpharetta last week at this link. Below is a sample. Mayoral candidates Jim Gilvin and Chris Owens, both members of the City Council until recently, spent a large share of their time discussing growth and what residents could expect under their administrations. Gilvin immediately set out to distance himself from the recent growth spurt the city has experienced in residential, commercial and office developments, particularly in the Downtown District. He said he has been the lone voice on the council, voting to reign in high-density developments and apartments. The fallout from this growth, Gilvin said, has been the city’s inability to keep up with traffic and other services. The problems the city now faces with traffic and pedestrian safety, he said, can be tracked to bad decisions the City Council made without calculating their impact. He said he would encourage the City Council to weigh the cost of development on the city’s infrastructure and on its aesthetics before approving major projects that come before the council. He was the only council member, he said, to fight against approval of a 168-unit apartment building as part of the downtown City Center project, a building, he added, that will obscure Alpharetta City Hall. I know everyone is busy this time of year. But this is a critical election for Alpharetta. The new mayor and two city council members will help set the course for our future and it will be important for that future to reflect the vision of the residents who live here. Please take the time to research the records and platforms of everyone currently running for office in the May 22nd election. And don’t forget that early voting at any Fulton County Library begins April 30th! Last year I wrote this article about the impact mixed use developments approved by our city council will have on traffic in Alpharetta. Now it seems some of the experts are even starting to voice concerns about the real estate trend that will soon add more than 100,000 cars to Alpharetta roads. You can read the full article by clicking the photo below.